A Milwaukee area driver is suing Uber Technologies Inc., the ride-sharing giant, in federal court, and seeking to make the suit a Wisconsin-specific class action. The suit, filed Friday by a lawyer representing driver Lamont Lathan, claims that the company misclassifies drivers as independent contractors when they should be termed employees – thus depriving the drivers of overtime pay and benefits. The suit makes numerous claims, including that the company withholds tips from its drivers, and that it violates minimum wage laws. The attorney representing Lathan, Brian Mahany, says he’s heard from some 200 drivers interested in being represented by him. The suit also names Travis Kalanick, Uber’s co-founder. Uber claims that it’s not a transportation company, but rather a technology company, the suit says. It provides both drivers and riders with smartphone apps that allow passengers to summon a ride and pay the driver electronically. Uber makes money from the transactions by taking a cut before passing the rest of the money on to the driver. 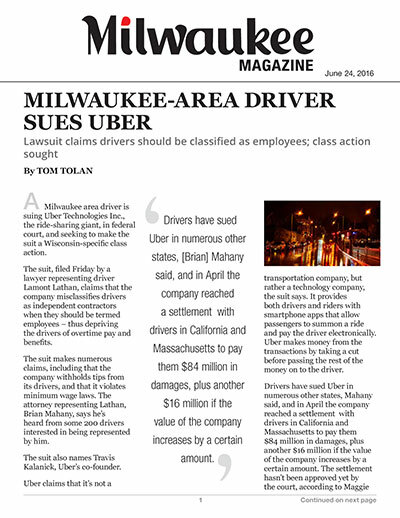 Drivers have sued Uber in numerous other states, Mahany said, and in April the company reached a settlement with drivers in California and Massachusetts to pay them $84 million in damages, plus another $16 million if the value of the company increases by a certain amount. The settlement hasn’t been approved yet by the court, according to Maggie Jessup, a spokeswoman for Mahany. Jessup and Mahany also said that many drivers in those states aren’t satisfied with the settlement. But Mahany said the law doesn’t prevent employees from setting their own hours. “There’s no legal reason behind that statement,” Mahany said.